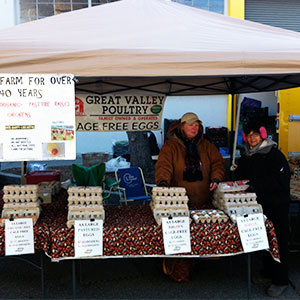 Great Valley Poultry in Manteca, CA is an organic certified poultry farm, producing eggs of the finest quality and size. We have been a full-service supplier to farmers markets in the Bay Area, CA since 2002. Take a look at the list below where you can find our farm-fresh eggs. Haight Ave. and Webster St.
Delta Fair Blvd. and Somersville Rd. CalTrain Parking Lot at El Camino Real and O'Neill St.
Todos Santos Plaza, Willow Pass and Grant St.
Evergreen Village Square, Ruby Ave. and Classico Ave.
Kaiser Permanente Medical Center, 710 Lawrence Exp. Fernandez Ave. and Pear St.
Parrot St. between E. 14th and Washington St.
Old Alvarado Park, Smith and Watkins St.
35th St. & 5th Ave. 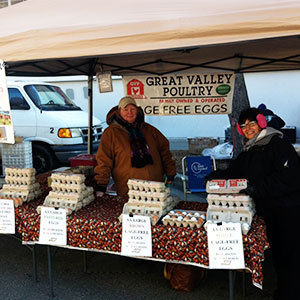 When you hear the name Great Valley Poultry, you know you are receiving the best cage-free eggs possible. Each egg that comes out of our farm is guaranteed fresh, organic, healthy, and of course, tasty! If you have questions, we are simply a phone call or a message away.